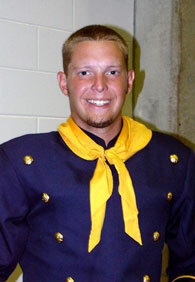 Troopers' tenor drummer, Tim Williams, talks with DCI.org's Christina Mavroudis about the corps' 2007 show, "Awakening" and some of the traditions of the corps. CM: How is the tenor line doing this year? TW: We're doing really well. We're trying to make everything we play and do as consistent as possible. That's been our goal this year. CM: What is your drum corps history? TW: I started with the Troopers in 2003 and 2004 and then I went to the Santa Clara Vanguard in 2005. When the drum staff left Vanguard last year, I followed them to Capital Regiment and now I'm back with the Troopers this year. CM: How important was the staff to you during that transition? TW: It was extremely important to me and was the only reason that I made my decision to change corps. One thing I learned at Santa Clara was that drum corps is not about the scores or the competitiveness, it's about the people you are around and the education. If you're receiving quality information from great people then your experience in the end will be a lot greater than if you're constantly going for a score. CM: How important are corps traditions to you? TW: They're very important. The two organizations that I feel are my home, Vanguard and Troopers, are very enriched with traditions from their past and they are very engrained within drum corps today. CM: What's the one Trooper tradition that represents the corps the best? TW: I think it's the slogan that we all use which is HLD; it means Honor, Loyalty and Dedication. We say it to each other all the time and it pretty much defines what it means to be a Trooper. One of the biggest things that made me fall in love with being a Trooper in the beginning was doing the right things all the time, and that goes right along with HLD. CM: Do you have any special moments that have stood out for you this year? TW: Since our show is called "Awakening" and since we're the "new" Troopers we wanted to keep some of the past with us, so the entire drum line wears buttons from the first original Troopers uniforms. We didn't feel it was a big deal, but a Troopers alumni who marched in the 70s came up to me in tears and told me how important it was to the alumni that we were keeping those traditions and the past alive. It meant a lot to me to know that the alumni is looking out for us and notices something as small as that.